"Using Iron Speed saved us about six to eight months of development time and approximately $128,000 in development costs. This project would have taken approximately 12 to 18 months without Iron Speed Designer." The Pulmonary Translational Core Portal was developed for The Ohio State University Medical Center, The Division of Internal Medicine, Division of Pulmonary, Critical Care and Sleep Medicine. Consisting of 33 faculty and 14 fellows, this division of the hospital provides the highest level of state-of-the-art teaching in pulmonary medicine and pulmonary science to clinical, scientific and University communities, as well as maintaining active research in both clinical and basic science research. 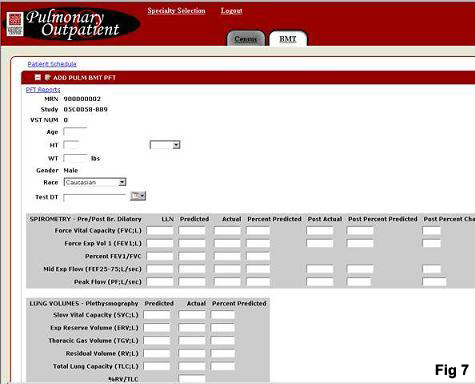 This application serves as a central data depository for all data collected during each pulmonary outpatient and inpatient study visit. Faculty, fellows, and clinical trials staff members in the Division of Internal Medicine, Division of Pulmonary, Critical Care and Sleep Medicine use this application on a daily basis. This application ties into the existing Medical Center Information Warehouse to pre-populate data elements thereby increasing accuracy and efficiency of data. Users access the portal in a wireless environment on a PC Tablet. 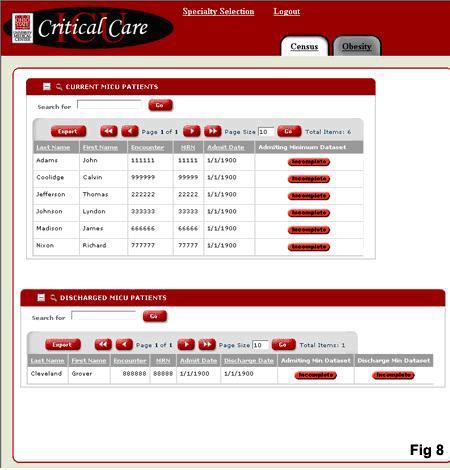 A user logs into the application (Fig 1) and depending on his/her level of authentication, is given a list of specialty areas (inpatient or outpatient) or reports from which they can select (Fig 2). Within these specialty areas are different study-specific data entry applications that are also available based on the user's access level. If a user selects an Outpatient specialty area, he is taken to the Outpatient Registration System (Fig 3). Here the user has the option to search for a patient using his MRN (Medical Record Number) or to select a tab for a particular outpatient study. The Outpatient Registration Systems allows the user to enter new patients into our system or edit already existing patient data (Fig 4). 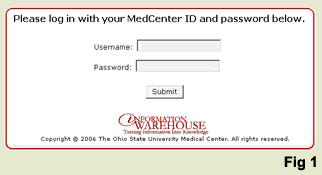 This patient Registration system is used to track all patients involved in Outpatient research studies. 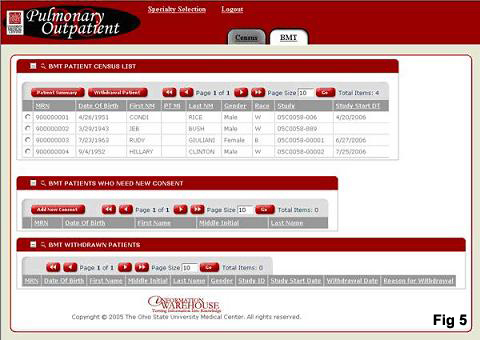 If a user selects a tab, he is taken to a study patient census page (Fig 5). From this page, the user can select a patient for entering study-specific data (Fig 6 and Fig 7). If a user selects an Inpatient specialty area, he is taken to the inpatient patient census (Fig 8). 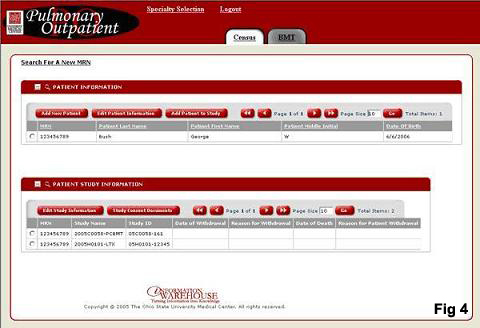 From the inpatient census page, the user can select a patient and enter general and demographic data or select a tab for a particular inpatient study (Fig 9). 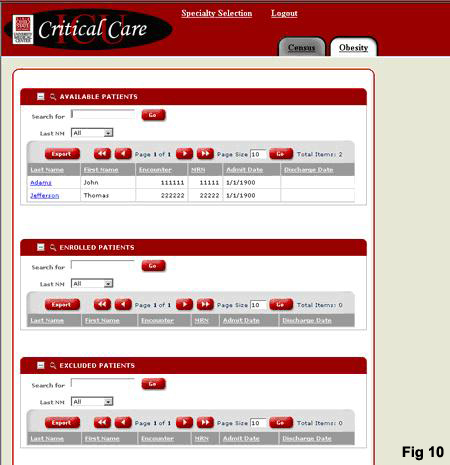 If a user selects a tab for a particular study, he is taken to a study patient census page (Fig 10). 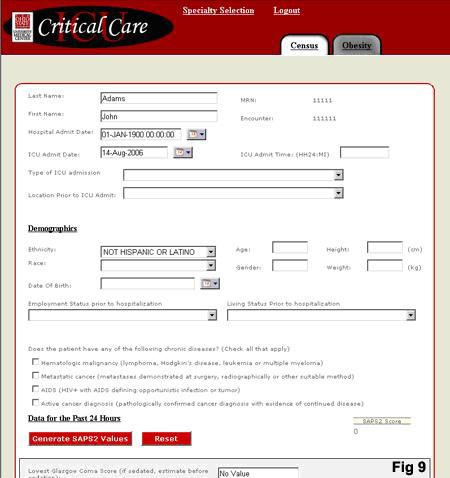 From this page the user can select the patient and enter study-specific data. The Pulmonary Translational Core Portal is a new application based on an existing paper system. Previously, if a clinical trial had 200 elements they would be manually entered in a Microsoft Word document. At the end of the trial someone would convert these to a Microsoft Excel spreadsheet and then hand import these elements to a database within the Enterprise Information Warehouse at the hospital. Today, this application has eliminated the use of Excel spreadsheets altogether. Now all of the information is entered directly into the database. This makes patient information much more accessible and allows the staff to analyze the results of each study through implementation of third-party statistical tools such as SAS. The application accesses three Oracle and Access databases comprising 116 tables and 134 web pages. The largest table is the ADT_VISIT table which contains 4,199,847 records to date and continues to grow. This table collects data for every patient who visits the hospital and maintains patient history. Currently there are 25 people using the application, processing between 20,000 and 25,000 transactions each month. There were five developers and one project manager working on this application. It took six months to develop, five of which were spent on the Iron Speed Designer portion. The hospital has very complex business logic, and therefore we spent a great deal of time customizing this application accordingly. For example, the Obesity Study requires a follow-up call 30 days after completing the study. Based on the patient's answers to a specific list of questions asked during this call, he may or may not require additional follow-up. We customized the application to navigate the user through various screens based on the patients' answers. Security — integrated with an enterprise identity management solution (LDAP - Lightweight Directory Access Protocol). We used our own custom security model for page- level security access. Code Telescope — Several pages utilized the Code Telescope in Iron Speed Designer to re-bind data to tables when a page post- commit transaction occurs. This was done to display data that was saved to the database. We also used the Code Telescope to add specific URL data onto links for each record control when it was created. Error Handling — Modified the application base classes to allow custom error messages to be displayed. Redirect — Modified the safe classes to append custom URL variables at the end of a URL string. Record manipulations — We modified Show Table records to dynamically display images links with custom URLs. Database Security — We added code to the base classes to access the database to set Oracle user roles. The Oracle user roles are used to establish the logged in users access to database objects. Calculations — A few pages contain code that pull manually entered data, perform calculations and place the answers into the form. Web Services — We added pre-existing web services to the portal for authentication (for login), database access (for specialized queries to pull data from the database) and application usage (to track who and how many users are using our application). PDF Display page — We created pages to upload and/or download PDF files to and from our database. Page Load Events — Several pages contain methods that will modify text and set variables on the Page Load event. We spent a great deal of time customizing the portal infrastructure as well. Now that we implemented this business logic for The Pulmonary Portal application, it will be very easy to apply it to other studies in different departments. While we did not directly incorporate third-party tools into this project, its users have discovered that Iron Speed Designer makes it incredibly easy to integrate advanced third-party statistical reporting tools into the application. Users need this software at the end of a study in order to evaluate and report the data collected throughout their study. We customized the standard application style sheets, as well as editing the graphics to fit our company standards. We did not need to create and application-specific design theme; instead we edited the pre-defined Fuji page style to better fit our company's standards. Using Iron Speed Designer saved us about six to eight months of development time and approximately $128,000 in development costs. This project would have taken approximately 12 to 18 months without Iron Speed Designer. The application was possible without Iron Speed Designer; however it would have been much more costly. There are currently other applications being developed, as well as a list of projects that have been backlogged that will be a part of the Pulmonary Portal application. A major advantage of the portal is the ease of incorporating additional Iron Speed Designer applications. We have proposed this portal to several other research groups in the hospital including the Cardiovascular Imaging Group. We will be adding more users and deploying additional sites going forward. This application and user group will grow with every new research grant that is taken on by a member of the Pulmonary Translational Core Group. Jason Buskirk has seven years of development experience in various languages and database systems. He has a B.S in Computer Information Systems from DeVry University and has spent the past two years working as a project manager for the Ohio State University Medical Center. Jessica Backer holds a B.S. in Information Technology from the Rochester Institute of Technology. Jessica has extensive experience with developing and implementing Coldfusion systems. Most recently she worked with The Strong Hospital at the University of Rochester to design and develop their Coldfusion system. Ryan Deiter has a B.S. in Computer Science from Northern Michigan University. He previously worked as an independent contractor for Cray Inc. where he was responsible for implementing and designing diagnosis software for Beowulf clusters. This required writing UNIX kernel modules that monitored sensors on each blade in the cluster. Chris Waugh has a B.S. in Computer Information Systems from DeVry University. He previously worked for Columbus Ohio Transit Authority (COTA) where he analyzed their scheduling system to maximize efficiency, and for Buckeye Elite Showcase Tournament where he developed a web application to register teams and players. Bryan Ball graduated from the University of Notre Dame with a B.S. in Computer Science. Most recently he upgraded Tempur-Pedic Inc.'s entire EDI infrastructure to work with Oracle 11i Applications using VB.NET, XML, and PL/SQL. He has experience with the functional design, implementation, testing, and troubleshooting of health care information software products in a client-server environment using Visual C++. Felix Liu has over ten years of Development experience in various languages, five of which were spent as a Database Administrator (Informix, Oracle). He has a Ph.D. in Chemistry from Tulane University. Felix has served as a System Administrator on almost every flavor of UNIX systems.